Home London & Oxford Einzelbilder Eats! Hi all! London was incredible! I am so happy and excited to share with you Part 1/3 of our June European Einzelbilder Travel Blogs. Thank you to Einzelbilder Travel for providing us with free t-shirts and stickers to represent them whilst overseas! This is also on my main blog – . We spent our first week of the holiday in London (with a day trip to Oxford) and were overwhelmed with the amount of vegan options available. Needless to say, we were very well fed. London is such a progressive and veg-friendly city. Here are (in our personal opinion) the best places to eat and shop as a vegan whilst in London/Oxford! Just a side-note: In London, Francis and I stayed in an Air BnB located near Paddington Station. For breakfast, we shopped at Waitrose (a chain supermarket) and ate cereal with soy-milk and fruit. I’ve said this in previous posts but Air BnB’s are great options for vegans as it can be difficult to source cafes that serve breakfast and it’s a comfort to be able to make your own food. 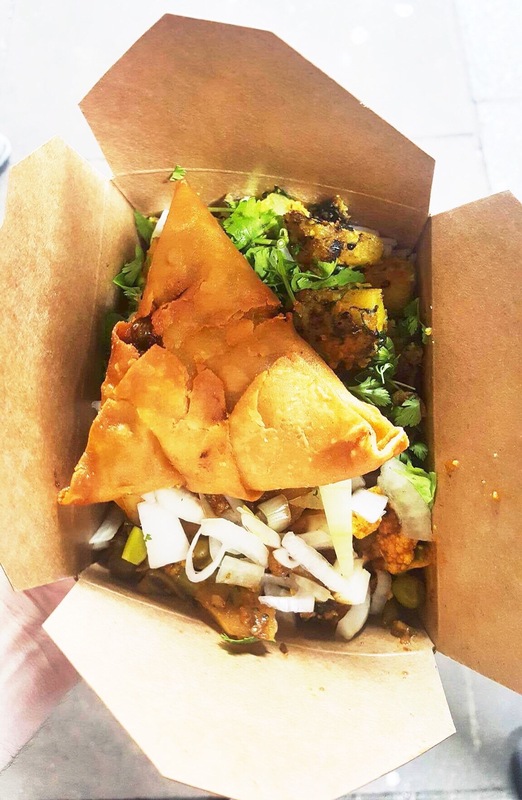 Located near the London Bridge, the are worth visiting as so many of the outdoor stalls offer different vegan cuisines. As it’s street food, you will also pay a lot less than you would in a restaurant/cafe. I picked up a vegan falafel wrap and Francis had what he claims to be ‘the best samosa he has ever eaten’. You can see many popular London sights surrounding the Borough Markets and keep going back for food. Just be warned, it gets incredibly packed so you may need to line up for a while and find a seat before they are all taken! is a chain vegetarian/vegan restaurant in the UK that is extremely popular. We ate there twice during our stay in London because the food was that good. It is open for lunch and dinner but the first night that we tried to eat there, there was an hour long wait so we went back the next day and sat outside until it opened to guarantee a spot. It offers a wide range of vegan meals that are quite healthy as well as a buffet style, serve-yourself lunch at the entrance. The one we visited was a 10 minute walk from the Piccadilly Circus station line. I had the Mexican Bowl lots of other goodies. is also close to the Piccadilly station line and really affordable. It’s such a cute cafe that serves vegan junk-food. We had the BBQ pulled jackfruit burger with soy-cheese which was insanely delicious! I love how instead of table-numbers you get an animal figurine. As you can see, we got a lion. I highly recommend checking it out if you happen to be in the area. London officially has it’s own ! This is a recent development so we were very lucky to see it opened and fully stocked with ethical goodies. Just like Sanctuary, it is also located in the Fulham area. I left a EinzelbilderTravel sticker on one of the shelves after perusing what they had on offer. You can buy everything from food, frozen-meals, laundry/cleaning products, pet food, beauty products, cosmetics and more. It’s great to see London becoming so progressive as an emerging vegan city. is such an underrated, hidden gem that I really want more people to know about it. Francis and I had a Jack the Ripper Tour scheduled in the area at 7:30pm and found this restaurant for dinner before it started. It is 100% vegan and serves a whole host of plant-based burgers. I ordered the pulled jackfruit with a side of chickpea bites and sweet chilli mayo. Incredible! With all these great tasting options available, why wouldn’t you be vegan? is another popular chain in London that you can find literally everywhere. It is an omnivorous Italian restaurant that serves really delicious vegan menu items. I was really impressed by the quality and serving sizes of the food. I ordered the lentil ragu and Francis ordered a vegan pizza which was huge. It was comforting to see Zizzi’s in nearly every location we visited. No matter where we went, there was always this decent option available. If you visit one place in London for a vegan treat, make it this one! is a 100% vegan/gluten-free ice cream and cookie bar located in the bustling Camden Markets. It’s a little difficult to find so make sure you have a map handy. Also, it gets extremely busy so expect to wait in a long line but it is worth it. I had a peanut butter and jam cookie with a scoop of soy ice-cream on the side. It was the most delicious thing I’ve ever tasted. Francis had a cookie dough milkshake which he devoured happily. I strongly recommend visiting this place and browsing the quirky markets for a fun day out. is a fancy vegetarian/vegan restaurant with various locations in London. It’s a great place for a romantic date and definitely on the pricier side. I ordered the smoked tofu and avocado salad with lots of fresh, raw vegetables. It was a decent portion size and tasted great. I wanted to include this place because it’s nice to go somewhere ‘upper-class’ as a treat from time to time. The Gate are big advocates on organic food and serving nutritious green meals. This in Fulham is absolutely amazing. Their specialties are seitan and hearty, savoury meals that will leave you feeling very satisfied. We went for dinner there one evening and I had the seitan ‘beef’ stroganoff and Francis had mashed potato with seitan pieces and veggies. Leave a good review on Happy Cow, they truly deserve it! If you are walking through Piccadilly Circus, make a stop at for lunch. It’s a vegetarian/vegan restaurant that operates on a pay-by-weight buffet service. All of the vegan options are clearly marked and you can easily fill your plate at a reasonable price. The aesthetics of the restaurant are really pretty too. It’s definitely worth a visit. All of the food was so delicious and healthy. Speaking of pay-by-weight, in London operates the exact same way. Vitao is the first place I’ve ever eaten at that offers oil-free food which was a nice change. Every item was full of colours and flavours. You eat different food depending on which day you come and you can also order fresh smoothies/juices. Just look at my beautiful plate! I could not finish all of it but I sure did try! is the first traditional English in London pub to serve solely vegetarian/vegan food. It really has that ‘Ye Old’ feel to it and on Wednesday evenings you can join in on sing-along’s by the piano! Make sure you book a table in the dining room upstairs in advance. This was our very last meal in London. We both ordered the vegan ‘bangers and mash’ with gravy. Surprisingly, the sausages were not made from mock-meats but rather just potato. It was similar to eating potato croquettes. I thoroughly enjoyed this meal and it was nice to sit in a classic English bar. Just off-topic, around the corner from Norman’s is the which is a store dedicated to official Harry Potter artwork. I loved it so much I went there twice. You should check it out if you’re a fan! By the way, make sure you go to the Harry Potter Warner Brother’s Studio Tour (see pic below) – it is everything! As I mentioned in my June Favourites post, Oxford was one of my favourite places that I visited. It’s only an hour train ride out of London and so incredibly beautiful with lots of history. For lunch, we went on a lovely 15 minute walk through the greenery and cottage houses to a classic English pub called the . It is in such a remote, gorgeous area. The restaurant itself is 100% vegetarian with lots of vegan options. It also provided one of my favourite meals in the UK: the Mushroom Medley Pie. Wow this was delicious. The pastry was so light, the potatoes crisp and the veggies cooked to perfection. They also serve lots of vegan beers, burgers, hot-dogs and mock-meats. An absolute winner – go Oxford! I really hope you enjoyed this vegan guide to London! We were absolutely spoiled in this wonderful city and I can see that it’s only going to grow with more ethical, plant-based options. Stay tuned for Part 2/3 – Italy! Thank you! Cookies & Scream is everything!! !